I’m the kind of person that can eat nothing but clear soup and fresh fruit for a week and lose just a pound, but if I have a Chinese take-away I put on half a stone. The problem is, I love my food so chances of cutting out all the tasty stuff is pretty much non-existent. If someone told me I could never eat bread (lovely, lovely bread!) ever again, I’d probably cry, or push them over, run away and barricade myself in the nearest bakery until they changed their mind. I’m not a huge snacker (either in size or appetite) but I’m not averse to tucking into a big bowl of something crunchy (NOT cucumber sticks!) while watching a movie so I like to keep a look out for reasonably healthy nibbles. I say reasonably because, despite what some manufacturers would like you to believe, unless you snack exclusively on fruit or veg, anything you eat between meals is going to be surplus to requirements and, the nicer it tastes, the less healthy it will be for you, that’s just the way it works. Recently Penn State Snacks were kind enough to send me a selection of their pretzels, including the newly re-launched (it was discontinued in 2009) ‘Worcester Sauce’ flavour. I’m going to hold my hands up here, I’d never tried these snacks before, I guess pretzels just weren’t on my radar – crisps, popcorn, nuts, yes, but not pretzels. Having sampled them, I’ve no idea why because they certainly tick all the boxes. Crunchy? TICK. Moreish? TICK. Tasty? TICK. As for healthy(ish), well yes, actually – go on, have another tick. The RRP for a 30g bag is 60p (£1.29 for 175g) and contains 131kcal (the Sour Cream and Chive is two calories more). The average bag of crisps (unless you count Quavers, which I don’t because they’re mostly air with a sprinkling of cheese dust) is usually around this mark. 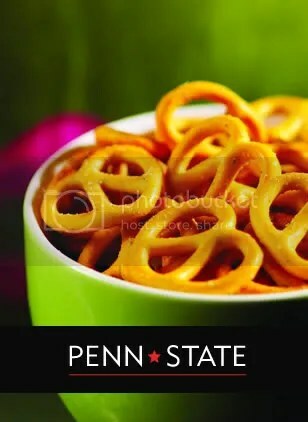 In addition to this Penn State pretzels are baked, not fried. Not exactly ‘guilt-free’ but certainly ‘less guilt-laden than most’, which is, frankly, good enough for me. I also like the fact that the packs clearly state they are produced in a ‘nut free factory’. Luckily I don’t suffer any allergies but having lived with a girl who did have ‘nutty issues’ (alas, she never required me to stab her in the heart with her ‘magic pen’ despite my interest in recreating the scene from Pulp Fiction) I have an insight into how difficult and restricting the condition can be. SO many foods say ‘May contain nuts’ or ‘Produced in a factory that also handles nuts’ or ‘Our manager might have had a Snickers this morning, so best give these a miss’ in an effort to cover their backs for their own sloppy provisions so it’s nice to see a snack so well labelled. These are being stocked in ASDA, Boots and Superdrug (among others) so I’ll definitely be picking up more when the mood takes. The 30g bag is perfect for snacking on the run or adding to a lunch box, while the larger bag is great for sharing, either during a quiet night in or as something for guests to munch with drinks before a dinner party. So, while I haven’t yet found my perfect snack (that would be a deep fried shredded crispy beef flavour pizza at 1 calorie a slice! ), these little guys will certainly do nicely for now. Previous Investing In The Not Quite Dead Next ‘Sup Cakes?